At Picture to Puppet, we are always very proud when we build a puppet who goes on to do great things! I was somewhat loth to part with this lovely cuddly baboon puppet, but it is great to see that he is now a highly successful DJ, and he is the first of our talking puppets to have his own mixing deck! 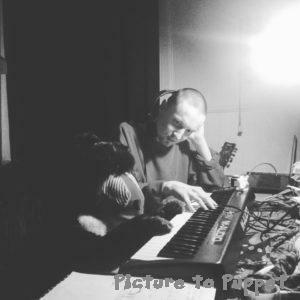 Along with his friend and fellow DJ Pete (AKA Wuh-Oh), Baboon loves experimenting with time signatures, dabbling in quirky chiptune, fusing jazzy rhythms or sampling whatever takes his fancy. Thanks to Pete’s careful tuition, he has even become an accomplished pianist, a fantastic feat for a baboon. He plays synths and keys live on stage and, most importantly, he makes dance music that gets everyone at his gigs dancing, including himself. He’s even been on Radio Scotland! 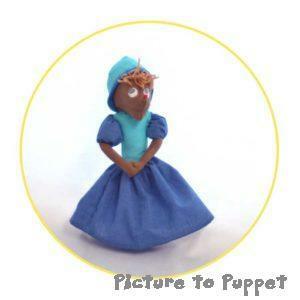 If you need a custom talking puppet made to order, Picture to Puppet can help! 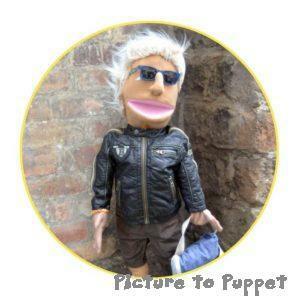 All you need to do is send us a picture or a description of your ideal puppet – if you can dream it, we can make it! All of our puppets are handmade by us in our Leith puppet Studio at 64 Constitution Street. We make talking puppets, glove puppets, cuddly toys and Jack in the boxes. 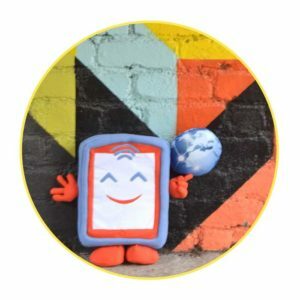 Find out more about our build a puppet service here! Contact us now to find out how we can bring your ideas to life! As a follow up to last week’s post about puppets around the world, this week we’re going to take a brief look at the history of puppets in the Western world! From Ancient Greece to the Muppets, puppets have taken all sort of forms and entertained all levels of society. There have been famous puppets like Punch and Kermit, and many more whose names are lost to history. Picture to Puppet is part of a varied and illustrious heritage, as you will soon discover! Ancient puppet shows were definitely entertaining! The earliest known drawing of puppets in Europe is from 1170, in the Hortus Deliciarum (“The Garden of Delights”) by Harrad von Landsberg, in Strasbourg. The text accompanying it says, “In ludo monstrorum designatur vanitas vanitatum,” which roughly translates as, “Playing unnatural things indicates vanity of vanities.” So this is actually a depiction of puppetry as a frivolous and vain pursuit. I think I’ve found Picture to Puppet’s motto. From references in artwork and writing, we know that puppets were used for amusement and telling religious stories around Europe in the Middle Ages, often being carried around by travelling entertainers. The 14th century “Romance of Alexander” has a margin illustration of a puppet booth. In the 18th century, puppet shows were fashionable entertainment. They featured elaborate sets and commentary on current events, with marionette or shadow-style puppets. However, in 1773, the opening night audience at the ‘Primitive Puppet Show’ The Handsome Housemaid rioted because Punch did not appear as a character. By the 19th century, low-budget travelling shows were once again the most common form of puppet entertainment. 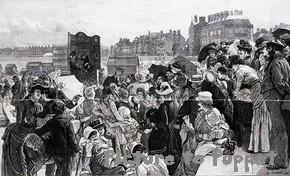 They became particularly popular at the seaside resorts that started to flourish in the late Victorian era. Punch and Judy shows had become iconic by this point, as depicted this 1887 engraving, and continue to entertain holiday-makers to this day. 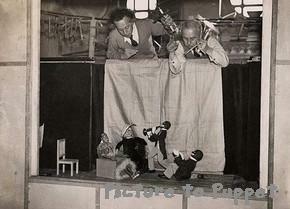 The 20th century saw efforts to revive and further develop puppetry traditions. The British Puppet and Model Theatre Guild (which Picture to Puppet belongs to!) was founded in 1925. The London Marionette Theatre was the first to broadcast puppet productions on television, in 1933. Puppets have been an important part of children’s television shows ever since. 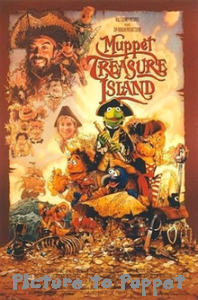 The most famous example has to be the Muppets, created by Jim and Jane Henson in 1955. The Muppets appeared on the American children’s TV show Sesame Street in 1969, and had their own show in the 1970s. There have been a number of Muppet feature films , and Jim Henson also directed and created puppets for cult classic Labyrinth, starring David Bowie. The Muppet characters have now become celebrities in their own right. Kermit, the original Muppet, has achieved what is perhaps the 21st century’s highest honour by appearing in multiple memes! 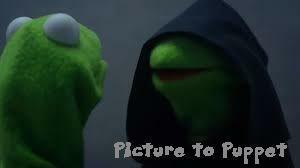 Me: Probably no one is that interested in the history of puppets… Me to me: Write a 700 word blog post about it. 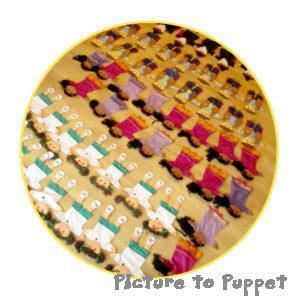 And today, Picture to Puppet is creating puppets for the modern world! We make likenesses of people and animals, celebrities and pets. Our puppets are used for teaching, entertainment, and political commentary. We have yet to make a giant phallus, but you never know. It’s all part of the great and illustrious history of puppets! Contact us with a photo, drawing, or idea, and we can make your puppet dreams come true! 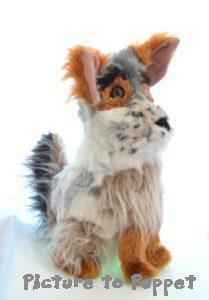 See some examples of custom puppets we’ve made here. Traditional marionette puppets are connected to the Commedia dell’arte tradition. They originated as a way to tell religious stories, but eventually the shows became too comedic and ribald and were banned by the church! In the 18th century, marionettes were popular with the aristocracy, and sets and puppet mechanics became increasingly detailed. 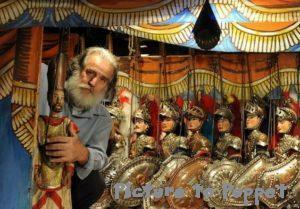 Italian marionettes have influenced the development of puppetry traditions around Europe. 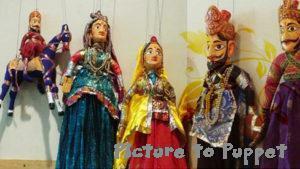 Kathputli are marionettes from Rajasthan, carved from wood and elaborately dressed and painted. They were developed by villages in the region for travelling shows, and eventually received royal patronage, which helped preserve the art form to the present day. The shows provide entertainment, but also the opportunity to discuss social concerns such as poverty and education. 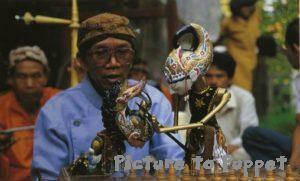 Wayang puppets are used to act out stories, often Hindu religious epics. 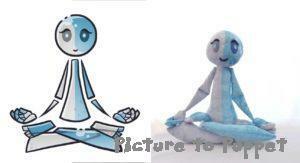 They can be flat cutouts or three-dimensional figures with joints, and are held up and moved with rods. The puppet master, called the dalang, is revered as a storyteller, philosopher, and spiritual guide. The puppeteer can operate several puppets at a time with the help of the ‘banana log’, a long piece of wood with holes that can hold up the puppet rods! 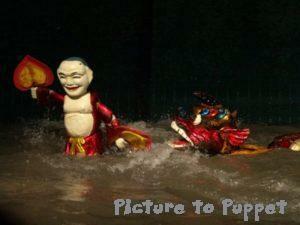 Mua Roi Nuoc are puppets operated in water, traditionally a flooded rice field! The puppets are made with fig wood that is dried and lacquered to be waterproof. They are moved with rods by puppeteers hidden behind a screen, giving the illusion of the puppet moving by itself on the water. Puppetry skills were traditionally passed down through families, and their techniques are still a closely guarded secret. 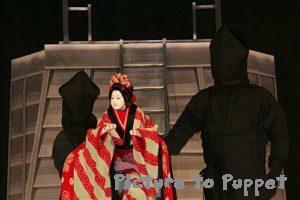 Bunraku developed in the 17th century in Osaka, and involves highly detailed puppets. The puppets are 2/3 scale figures with elaborately mechanised features, including moving eyes, mouth, and eyebrows. Each puppet requires three people to operate it! The puppeteers are visible on stage, but wear black in order to blend in to the background. 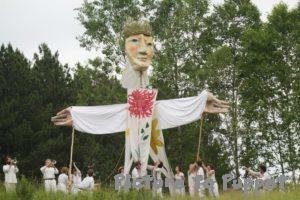 The Bread and Puppet Theatre Company, based in Vermont, creates large puppets that are part of performances focused on social activism. 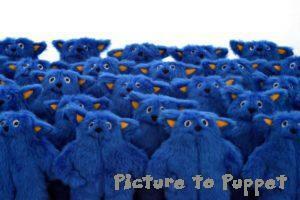 The puppets can be 20 feet tall and carried by multiple people. They are characterised by detailed, expressive faces, and abstract cloth bodies. The theatre company is dedicated to the principles of making art accessible, relying on many volunteers, and advocating for social justice and the environment. 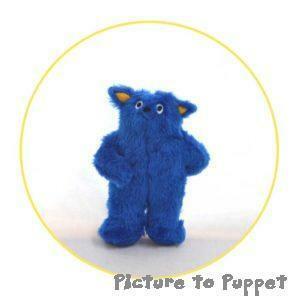 Picture to Puppet will try to meet whatever your puppet needs are, with custom puppets made to order. 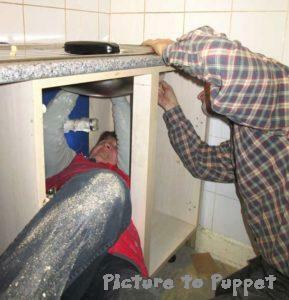 We offer a variety of mechanisms to make your puppet come to life. Soft toy repair for all! Leith Toy Hospital, located in Picture to Puppet’s studio on Constitution Street, is proud to serve any soft toys that are feeling poorly, or in need of patching up. Many places specialise in one type of toy, such as a doll hospital or teddy bear hospital. We open our doors to everyone. 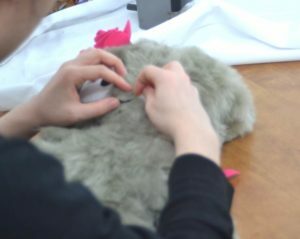 Whatever type of soft toy repair you might need, we will do our best to make it as good as new! Many of our patients are teddy bears who are well-loved and in need of repairs. These can range from stitching up a seam that has come open, to making a completely new skin! 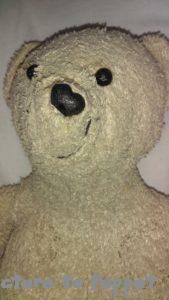 This teddy bear came in needing some new stuffing and freshening up. He was sent home feeling much better, with a prescription for lots of hugs to complete the cure! It’s hard to tell, but this teddy had a completely new pair of dungarees and cap made. We carefully stitched on over the originals, which were getting too fragile. We’re very careful to retain the original materials wherever possible, making only the changes needed to complete the teddy bear restoration. Patients who come into the toy hospital will always go home with their expression and character unchanged. They’ll just be mended and looking at their best! All sorts of soft toys come into Leith Toy Hospital for repairs. We’ve fixed up all sorts of creatures, from bunnies and bears to pokemon and unicorns. This bunny needed a new nose and stuffing. Doesn’t he look much better, with a new ribbon bow as a finishing touch? If you have a favourite soft toy in need of some repairs, let us know! You can send an email with a picture and we’ll give you a diagnosis, or just stop by the studio. We can often do simple repairs while you wait, so your child doesn’t even have to spend a night without teddy. Get in touch to find out what we can do to give your toy a new lease on life. Find out more about toy hospital pricing and previous jobs here. 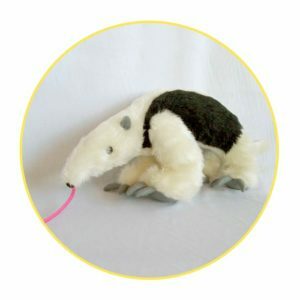 “No one makes a tamandua stuffed animal,” you’ve thought to yourself sadly. 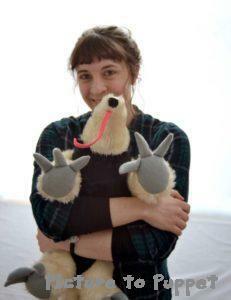 But your anteater woes are over, with Picture to Puppet’s custom stuffed animals! Some of the most enjoyable jobs at Picture to Puppet are strange and unique stuffed animals. 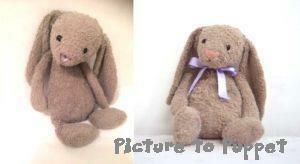 We can make a custom plush toy from a photo or turn drawings into stuffed animals. There is no minimum order, so we’re happy to make one-of-a-kind custom plush toy. 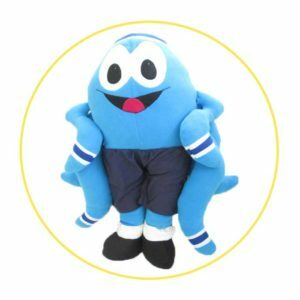 Whether you give us a photo to work from, or design your own stuffed animal based on your imagination, we can create the custom soft toy of your dreams! 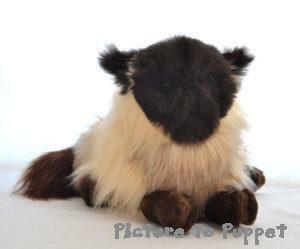 If you aren’t looking for a soft toy of a specific animal, such as a pet, we can work from general reference images. We end up learning random fun facts by looking up weird animals. 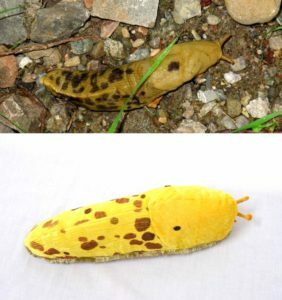 For instance, did you know that there is an annual banana slug festival in Russian River, California, featuring slug races and a recipe contest? Neither did we, until we had to make a banana slug plushie. 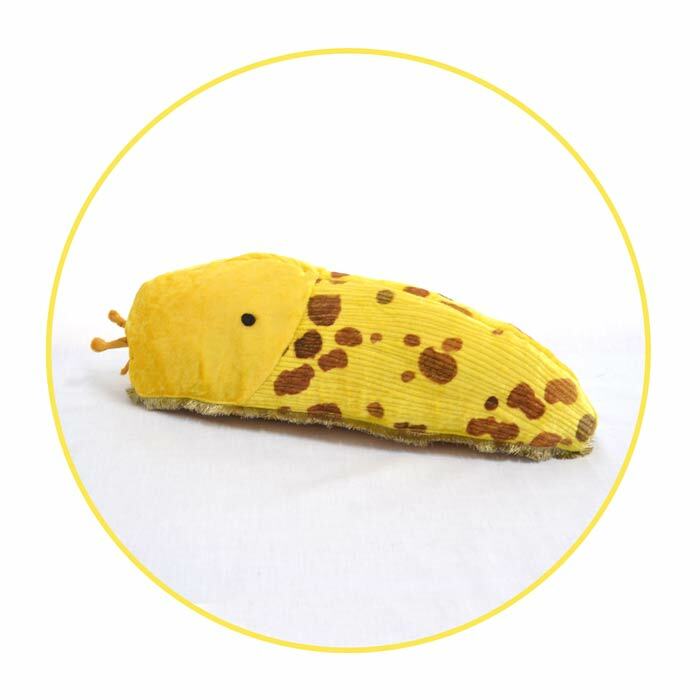 We do our best to create a realistic resemblance, but our custom plush banana slug is cuddly rather than slimy! Picture to Puppet started out making puppets based on children’s drawings, but we can easily turn drawings into stuffed animals as well. 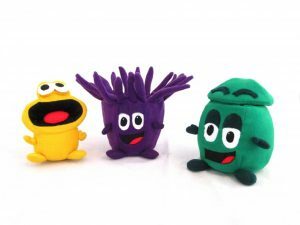 Whatever you or your child can imagine can become a custom plush toy! 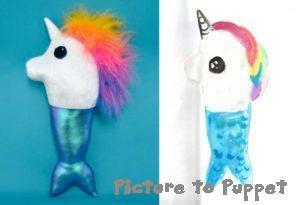 Now you can have a mermaid unicorn of your very own! Is your favourite animal something so obscure that it’s impossible to find a plush toy of it? Have you invented the perfect hybrid creature? Send along a photo, drawing, or tell us about your idea and we’ll make it reality! Contact us today so we can make your stuffed animal design a reality! Take a look at other custom soft toys we’ve made if you need ideas. Have you ever wished you could make a custom stuffed animal of your pet and keep it forever? Maybe your toddler wants to cuddle the cat more than the cat wants to be cuddled. 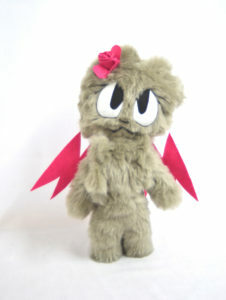 A custom cat plush would be a better object of affection! All my friends at university missed their pets, and would have loved to have a custom stuffed dog to remind them of home. Perhaps your beloved pet has passed away, and you want a stuffed animal pet memorial to remember them by. 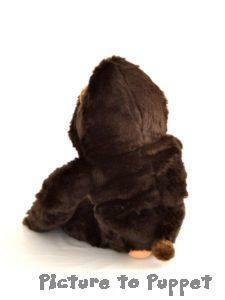 Or you just want to see what your furry friend would look like as a cuddly toy! Whatever the circumstances, a custom pet stuffed animal makes the perfect gift for yourself or someone else, and Picture to Puppet is here to help! We know you don’t just want a generic cat or dog. 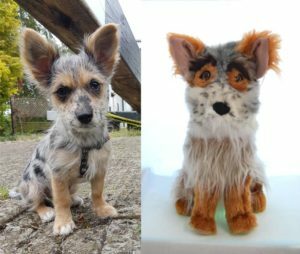 We take the same care with a custom pet stuffed animal as we do with the likeness of a person, working from photographs to capture your pet’s unique colouration and personality. We loved this puppy’s playful personality! It was a challenge to replicate his variety of colours and textures, and we needed to combine a variety of furs. Now his owners will be able to remember how cute a puppy he was, even as he grows up. This gorgeous cat required hand-stitching to get her face the right shape. This plush was requested of a neighbor’s cat (with permission) so that a little girl could have one of her own. Custom pet stuffed animals are the perfect way to ensure there are enough cuddly animals to go around! Get in touch with us using the contact link below, and send us clear photos of your pet. It’s helpful to have a couple angles, such as front and side views. 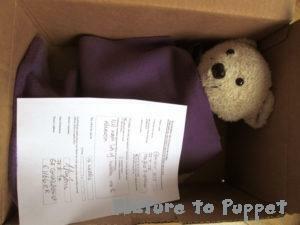 We’ll ask what size you want your custom pet stuffed animal to be, and what position it should be in. If you have any other specific requests, let us know and we’ll do our best to make your custom cat or dog plushie exactly what you want it to be! We aren’t limited to cats and dogs, either! Take a look at our custom soft toys page to see examples of weird and unusual animals we’ve made. We would be happy to make a custom pet stuffed animal of any kind! Contact us about making your pet into a custom pet stuffed animal! 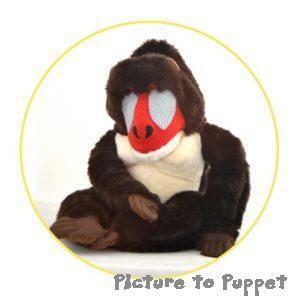 See other examples of our custom pet soft toys here. In 2013, I set myself up as a puppet builder in Edinburgh. 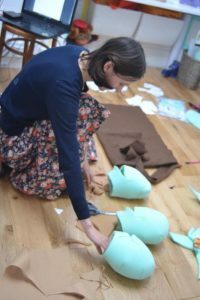 Now that it’s been five years, I thought I would write up the story of my journey as a puppet builder, from where I started to where I’m at so far. Oddly enough puppets have not been a lifelong love of mine. Although I am very into them these days, until five years ago they were not something I had given much thought to. I just took a random commission making a puppet for a friend’s nephew and enjoyed it, and that’s where it all started. Here was the first Picture to Puppet Puppet, a scary but cuddly seamonster (left). I had a website for my dressmaking and stuck a picture up there. I also made some puppets based on drawings that children in my mum’s class had done, and stuck those up too. That first year, odd jobs came through in drips and drabs, although definitely not enough to get excited about. Just as my gap year came to an end and I was preparing to return to college, a language school got in touch. They said that they were looking for a regular supplier or glove puppets. To begin with, they were looking for a hundred! That was what first got me thinking, maybe I could be a puppet builder for a living! Finally when I went back to college and entered the throws of my final year, the whole thing took off and I got orders all the time! It wasn’t great timing. I would work in college all day doing coursework, then go home and work on bulk orders of toys made to order all night in my bedroom. I took on some second years from my course who used to come and help in the evenings. Somehow we got through it! After I finished college I worked part time for a year in all kinds of classy jobs including working in the pie van at Murray field and altering enumerable crotches in the windowless room behind slaters. I’ve been a full time puppet builder now since 2015. It’s a lot simpler than juggling a whole lot of crappy jobs, and a lot more fun. It never gets boring. Every commission is inherently different and I’m always learning new things. We have a really nice mix of bulk orders and custom builds. We’re also always diversifying into different types of puppet and toy. The latest addition to our portfolio is Leith Toy Hospital in Edinburgh. 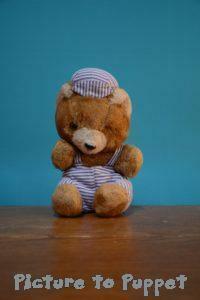 Anyone who has a poorly or broken teddy can bring it in to our Constitution Street toy shop for some bear repairs or toy mending. We love doing it and seeing the children’s faces when their teddies are all mended! Now we offer hand puppets, talking puppets, muppet style puppets, glove puppets, sock puppets, finger puppets, soft toys, jack in the boxes and a toy hospital. We also offer moving eyebrows, blinking eyes, arm rods, moving fingers, moving brows, twitching noses, wiggling ears, moving eyeballs… and who knows what next! 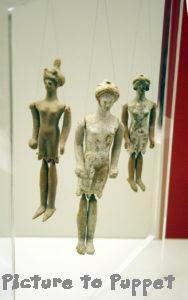 I am currently learning about marionettes and and hoping that this will be the next addition to our repertoire! Who knows where we’ll be in five years time! It’s now been five years since I set myself up as a puppet maker. 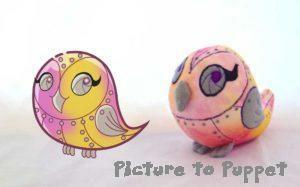 My business, Picture to Puppet, is a small Edinburgh puppet company making puppets and cuddly toys to order. Mostly from day to day I’m focused on the daily tasks of running the business, which is lot of fun mixed in with a fair bit of drudgery! But I thought I would take this opportunity to look back at the whole five years, and reflect on what I’ve achieved. Apparently about 90% of start up businesses fold within the first 5 years, so having made it through the first five years feels like a big achievement. The creative sector is a notoriously difficult sector in which to make a living, and the toy making sector in the UK has almost disappeared due to competition from China. Because of this, people are often surprised to learn that I can make a living as a puppet maker in Scotland at all. In fact we are growing all the time. It started of as just me making puppets in my bedroom at night after I finished College. Now I work full time and have a lovely employee. We have a big sunny puppet making studio on Constitution Street. We get orders in every day and ship all over the world. We’ve made custom puppets and toys for films, TV ads, ventriloquists, local councils, educational resource companies, parents… the list is endless. How have we made it work? 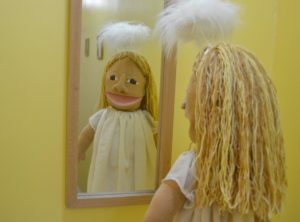 I set myself up as a puppet maker when I was straight out of college, and used to not making much money. This helped because it’s very difficult to make a lot of money at the start of a new business. Keeping overheads low has been a big help. For the first 4 years I ran the puppet company from my bedroom, and worked as a puppet builder online. I ran the puppet company part time for 2 years before I went full time. During this time, I took on all kinds of classy jobs, including working in the pie van at Murrayfield and altering enumerable crotches in the windowless room behind Slaters. Thankfully that is all behind me and there is now enough work for me to be a full time puppet maker and employ someone else of top of that. We have a lovely sunny studio to work in where people can drop by if they want to, and lots of storage space for all our materials. I am still very careful to use every scrap of fabric so that nothing is wasted. We even make our pattern pieces from bits of spam that come through the door! I think our adaptability has been a big factor in our success to date; I’m always pushing myself to learn new techniques and experiment with different materials. Usually if someone asks me if I can do something and I don’t know how to do it, I say “yes” and learn how to do it as fast as I can! I’ve always been open to trying lots of different business models and strategies, and have built the business around the ones which have worked best. Despite this, I’m careful to ensure that my key values remain central to the business. These include environmental sustainability and having a healthy, happy and engaging working environment. For example, I won’t ever decide to outsource any toys to a sweatshop in China, because I believe that would be unethical. In addition, it would risk my role shifting my role from a predominantly practical one that I love to a largely administrative one that I would dislike. For me, keeping my job as a puppet maker enjoyable and stimulating is fundamental. Many businesses fold in the early stages not because they aren’t good, but because the people running them have rubbish time and decide to stop. And finally, I wanted to say a huge thankyou to everyone who has contributed to making Picture to Puppet a success! To every client who has put their trust in us to make their ideas into custom plush toys and puppets. Thankyou to everyone who has sewed away with me over the years. Thanks to Rob for all his ace web advise and designing our beloved mascot Phyllis! Thanks to the folk at Launch.ed and Business Gateway for all your help and advice. Thanks to my parents for renovating this amazing workshop. And finally thanks to my family and friends for believing in me and encouraging me every step of the way. Here’s to the next five years of glorious Puppet Making! Recently we’ve been making lots of personalised soft toys for to order, so I thought I’d write a bit about them. ften people order a personalised cuddly toy based on their child’s drawing, or a family member. Other times it is companies who may be ordering soft toys from their mascots or logos. 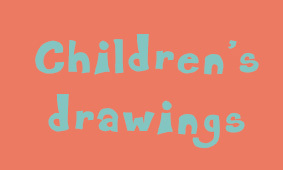 Schools and local authorities sometimes run design your own toy competitions, and children draw a soft toy to enter. Recently we made some soft toys based on video game characters for a game designer. Also lately we have been making cuddly toys of pets. People often ask me how I go about creating personlised plush toys. Here’s how it usually works! Got an idea for a personalised soft toy? Come and visit us at our 64 Constitution Street studio.